STRATFORD, Conn. -- The late-afternoon sky had fallen silent in contemplation of its next move as Bob Baird unlocked the gates at Frank DeLuca Field in advance of the evening's scheduled doubleheader. For the past two decades, Baird has been the general manager of the Stratford Brakettes, and thus the caretaker of one of the most successful runs in the history of American team sports, but he's as much at the mercy of the weather as opponents are at the hands of his team. An afternoon thunderstorm had only slightly diminished the dark hue of the clouds that still loomed above the Connecticut coast, but it had already turned Baird's infield into a swamp seemingly unfit for softball. 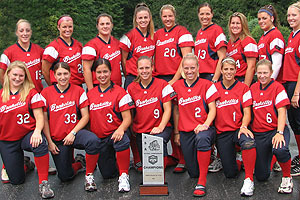 The 2007 Stratford Brakettes, who captured ASA championship No. 28. "We're going to play," Baird said by way of introduction, although it sounded less like a status report and more like a warning to any remaining potential precipitation. After nearly 62 seasons and more than 3,700 games, the question is, for how much longer? The Stratford Brakettes don't often lose on the field, having won 28 Women's Major Fast Pitch national championships (the top division sanctioned by the Amateur Softball Association of America). But without a sponsor following the death of the team's primary benefactor last year and facing a sports landscape increasingly unfriendly to mom-and-pop business models, it's equally imperative these days that they not lose games -- and gate revenue -- to the weather. That's why a team that has played everywhere from New England to New Zealand in the past is spending this summer playing a 56-game homestand in an effort to cut down on expenses and hopefully stay in business. A former newspaperman who covered the Brakettes for nearly two decades before taking over as general manager in 1988, Baird is an archetypal Connecticut Yankee. Those who work for him at DeLuca Field, many of whom have themselves been doing this for decades, joke about how infrequently he's fired them this year and how he must be softening in his old age. If every other sentence out of his mouth is a sarcastic one-liner, it's only because the other half are used to bait anyone in the vicinity into setting him up. He's everywhere during games: hanging around the concession stand until someone in the cramped quarters exasperatedly kicks him out, wandering in and out of the radio booth to taunt his son Rob (the team's play-by-play announcer) or keeping tabs on the high school students he coaches at Stratford High School who volunteer at DeLuca Field. That the Brakettes took the field at all this season is in large part a reflection of stubborn persistence on the part of Baird and manager John Stratton, a veteran of 31 seasons. But even Baird's big shoulders and bigger voice sag a little under the weight of current circumstances. He is the man in charge of perhaps the longest-running success story in women's team sports, a team that was winning championships and drawing attention decades before Title IX signaled the start of a revolution in athletic participation. "It's been hard," Baird conceded. "I'm the guy that goes home and counts everything, and I'm projecting, 'This is what we're going to make; are we going to make it here?' I'm always looking at the Weather Channel. It scares the hell out of me when they're calling for 60 percent chance of rain on a Saturday night, and that's your best draw." The rain held off on that particular Saturday night long enough for the Brakettes to sweep a pair of games from a team from western New York, although the combination of threatening weather and the diversion of the Fourth of July holiday weekend likely helped keep the crowd in the low triple digits. Nightmares about a repeat scenario have Baird even more meteorologically neurotic than usual this week, with the United States Olympic team coming through Stratford on Sunday for an exhibition. Bringing a full house expected to come hungry for softball and hopefully hungrier still for concessions, the game against the Olympic team will make or break the bottom line for the summer. 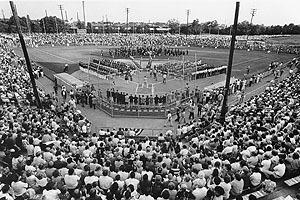 A crowd of more than 12,000 people attended the women's world championship at Raybestos Field in 1974. None of which is readily apparent from the product the Brakettes put on the field. Listen to Rob Baird, the second of Bob's six children, broadcast win after win to Internet listeners in places as distant as Mauritius and Japan, and it's easy to believe nothing is amiss in Stratford. The team has captured five of the past six national championships, and with a 36-0 record through July 17, it's threatening to add another title in August. From fast-pitch pioneers like Joan Joyce and Bertha Tickey to subsequent generations of Hall of Famers like Dot Richardson, Lisa Fernandez and Sue Enquist, an astounding number of the sport's legends have spent at least a summer or two in Stratford. In the past five years alone, the roster has included names like current Olympians Cat Osterman and Kelly Kretschman and 2008 Women's College World Series MVP Katie Burkhart. Now Kaitlin Cochran, Burkhart's teammate at Arizona State and the likely front-runner for every major college award next season, is the most recent addition to the roster. An avid fan of baseball history, especially anything relating to her idol Ted Williams, Cochran is equally reverent about her surroundings in Stratford. "I wanted a chance to play with a legendary program like this," Cochran said. "I know anyone from Sue Enquist to Cat Osterman and Lisa Fernandez, they've all played here. And I really wanted to find out their secret to success. I just want to learn more about their history and be a part of it." Karen Johns, one of Mike Candrea's assistants on Team USA, is another member of the Brakettes' sprawling alumni network. Known in her playing days by her maiden name of Karen Sanchelli, the New Jersey native competed against the Brakettes as a teenager and played with the team during 1989-90 and again in 1993-94. Like Cochran more than a decade later, Johns saw the Brakettes as something more than a typical summer sojourn. "For a female, it's kind of like the Yankees calling you in and saying, 'Hey, we want you to play,'" explained Johns, formerly the head coach at both the University of Florida and the University of Virginia. "I'll never forget that opportunity that they gave me to play, and just to catch for the best pitchers who ever played the game. I got to catch for [Kathy] Arendesn and [Barbara] Reinalda and Fernandez and [Cheri] Kempf. You name it, I caught them. It was a dream come true. Because there were no Olympics when I played until the bitter end, it's as close as it comes to playing on the best team that's ever taken the field." Joan Joyce played for the Brakettes during 1953-63, and from 1967 to '75. A self-professed tomboy growing up who played baseball with the boys, Johns remembered her dad bringing her to Stratford to see the Brakettes when he decided it was time for her to move into women's sports. 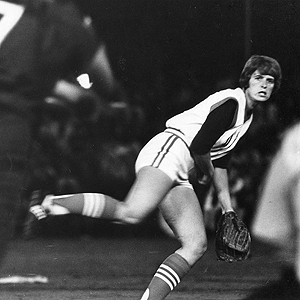 One glimpse of Joyce, still second all-time in wins for the team, was all it took for the baseball player to fall in love with softball. Joyce is also a big reason current second baseman Mandie Fishback is in her second season with the team. An Oregon native who didn't grow up on stories of the East Coast juggernaut, Fishback played for Joyce at Florida Atlantic University, where Stratton also serves as the pitching coach during the non-summer months. NCAA rules prevented her from playing for Stratton during the summer while she was still in college, but the stories she heard about the Brakettes brought her to Connecticut after graduation. While about half of the current Brakettes are active college players looking for a competitive place to play over the summer, the rest are like Fishback. After finishing at Florida Atlantic a year ago, she joined the Brakettes last summer before heading overseas to play professionally in the Netherlands. Back in the Unites States this summer, she passed on an opportunity to pursue a place in National Pro Fastpitch, the six-team domestic professional league, to once again play for Stratton in Stratford. For all the good things the NPF has to offer, the truth is Fishback didn't turn her back on the potential for a bundle of money when she opted to play for free in Stratford instead. For someone who hopes to move into coaching down the road, the allure of an organization with the history and contacts of the Brakettes -- not to mention the chance to win another championship -- was worth more than a few thousand dollars of summer salary. Some players live locally and commute to games, while others share a house near the beach that the team has rented for years. Many find whatever day jobs they can that allow them to keep evenings and weekends free for softball, whether it's working at camps and clinics for young players, or in the case of third baseman Jessica Mouse, working under the sun at a local farm. And whether it's someone like Amber Radomski, a former ball girl who dreamed of wearing the familiar red jersey, or a newer convert like Fishback, the players seem to appreciate that in an era of athlete entitlement, playing for this team remains a privilege. "Since I've been here, I've learned more than I could have ever imagined to learn," Fishback said. "It's huge. I love being in the town, in Stratford, because it's just everywhere. Everywhere you go, people know the Brakettes. I really like that. I think it's such an honor to play for this team, and it's such an honor to be here." 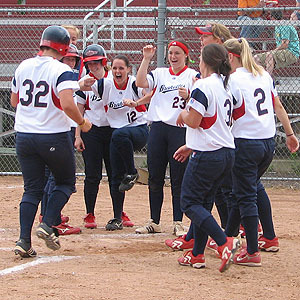 Catcher Jessica Serio is greeted by her fellow Brakettes at home after a home run earlier this year. Fishback wants to return for as long as Stratton will have her -- former Olympian Danielle Henderson is currently the longest tenured player on the roster with seven seasons spread over three stints -- but there first must be a team to which she can return. As might be expected for a women's team that has been around as long as the Brakettes, this isn't the first time the organization has faced financial adversity. Since longtime sponsor Raybestos Manhattan dropped the team after closing its Stratford plant in the early 1980s -- the name Brakettes was derived from the brake components that used to be manufactured in the area -- uncertainty has dogged the team's financial outlook. Two weeks before the national tournament in 1990, Baird found himself on a pay phone in Westerly, R.I., going back and forth with potential sponsors to try to find the funding that would get the team to Redding, Calif., for the event. Within just a few minutes of folding up shop -- his best bet was leaving for vacation at the end of that day -- Baird got the sponsorship he needed from the familiar name Raybestos, this time from the company offices in Crawfordsville, Ind. The team needed three different flights to find enough seats on short notice to get everyone to California for the national tournament, but they got there. And they got there just in time to win another national championship. Cut loose again by Raybestos six years later, the Brakettes subsequently enjoyed more than a decade of financial security when former minor-league baseball owner and local businessman Dave Carpenter agreed to sponsor the team in 1996. But Carpenter passed away last June, and after the team won another national championship a month and a half later, Baird got a call in the South Bend airport from others in the Carpenter family first congratulating him but then informing him they wouldn't be able to continue sponsoring him. "We knew something was up when nobody else [from the family] came to watch us play the rest of the year," Baird recalled. "Our only regret is he got sick and he never saw us win a national championship." Without Carpenter, the Brakettes face an uncertain future. Overall, softball has never been healthier. Attendance and television ratings continue to grow for college softball; the Women's College World Series in Oklahoma City set another single-session attendance record this year. New facilities at schools like the University of Tennessee and the University of Michigan speak to the game's geographic reach and importance within athletic departments. But between the college game and the NPF, in which the Brakettes fielded a team for one season, there is also more competition than ever before. With the help of the father of one of the current players, the Brakettes were able to apply for non-profit status this spring. The move, which Baird joked merely confirmed the relationship with profit the team had been operating under for years, should make it easier in the future to solicit donations. For now, it's just about getting by. "John and I sort of made up our minds that we were going to try and give it a go as best we could," Baird said of this season. "We put everything on paper to figure out what it was going to cost. And of course, when I put it on paper, I didn't figure out everything it was going to cost. There's always a little of this and a little of that." Ashley Waters (left) and Mandie Fishback sign autographs after a game this year. It's painfully ironic that a team which frequently represented the United States as a de facto national team in international competition before there was a national softball program now finds itself counting on one nine-inning exhibition game against the Olympic team to pay its bills for the season. "Hopefully we can make $20,000 to $25,000 and that will save our year," Baird said. "That right there will save our year. We have a few other guys that said if you come up a little short, they'll each throw in a few grand -- that kind of thing. But we do not have one big-time sponsor. I understand the economy. It's just a shame, 62 years with the tradition, all the nostalgia, the reputation for this program, just getting good people -- role models. "What can be better for kids to come to see than this?" That's how it was for Rob Baird, who was stocking potato chips in the concession stand at 7 years old. He idolized Don Mattingly, Michael Jordan and John Riggins growing up, but he also counted athletes like Dot Richardson among his heroes. Now married to Brakettes pitcher Leslie Malerich and working a full-time job in addition to the hours he puts in at the ballpark every summer, he's realistic when outlining the need to convert the growing number of girls playing sports into paying customers now and in the future. But there are parts of our communities and our heritage that are difficult to place within a fiscal perspective. "This is a huge year, knowing that it's already out of the Olympics [after Beijing]," the younger Baird said. "Softball can't afford to lose the Brakettes. The town can't afford to. The Brakettes can't afford to just go away; they've meant too much to the sport all these years." Wetlands sit beyond left field at DeLuca Field. When dusk comes in the late innings, it requires only a small leap of poetic fancy to envision the pitchers warming up on the grass between the left-field fence and the tall overgrowth of the vegetation beyond as the ghostly ballplayers in "Field of Dreams" strolling out of the Iowa corn. It's easy to see the past here -- easier than it is anywhere else in women's sports. The team may have moved to DeLuca Field from a nearby field two decades ago, but when Cochran launches a line drive off the base of the fence and makes the turn at first base, she's sharing the base path with Joyce, Kretschman and all those who came before her. The Brakettes built this. They're just hoping people will still come.